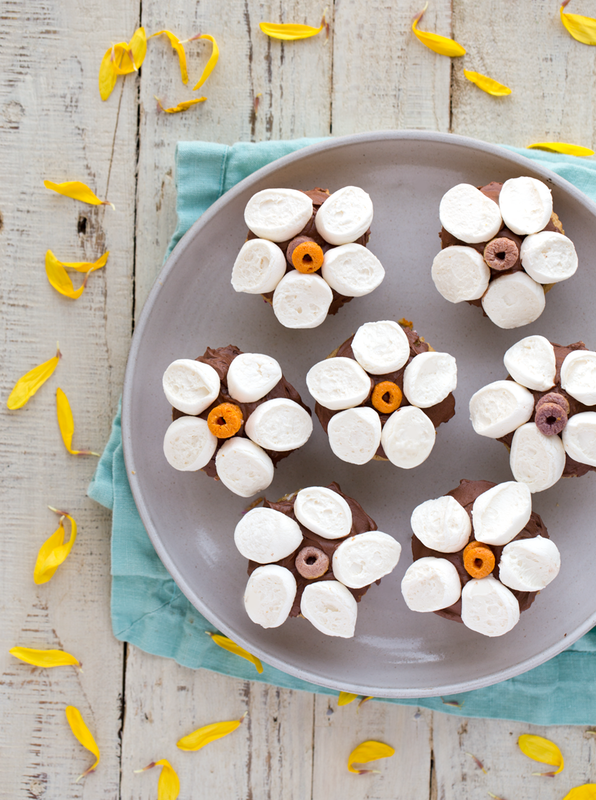 These cute, vegan Marshmallow Flower Funfetti Cupcakes are perfect for spring! 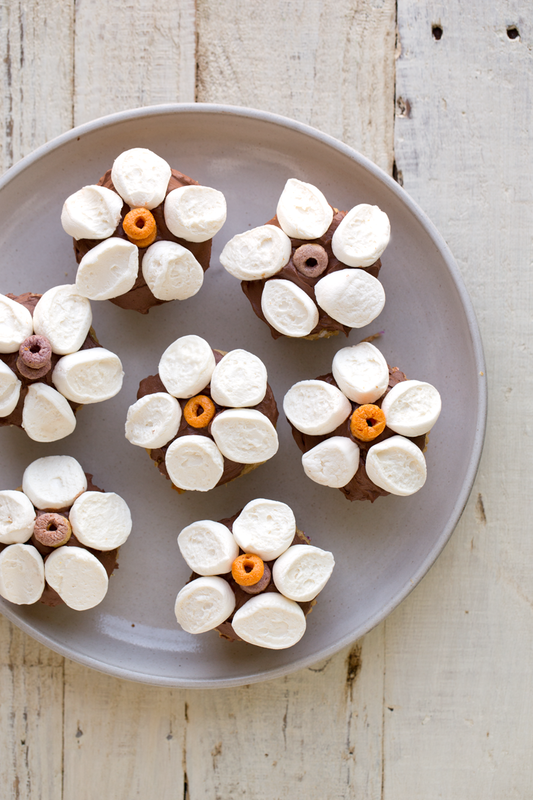 I don't even remember where I saw these first online, but if you google 'marshmallow flower cupcakes' you will find a bunch of variations of this crafty cupcake. 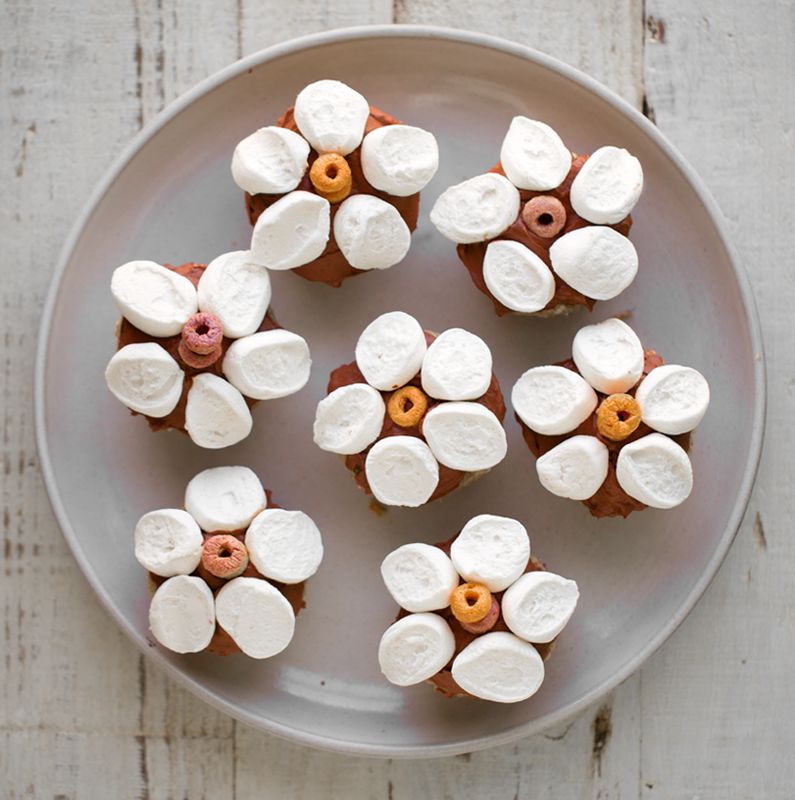 You can even get more creative by coloring the 'petals' with colored sugar or colored frosting. But I love these pretty white daisy-looking flowers with a simple cereal center. Funfetti cupcakes as the base and chocolate frosting on top. 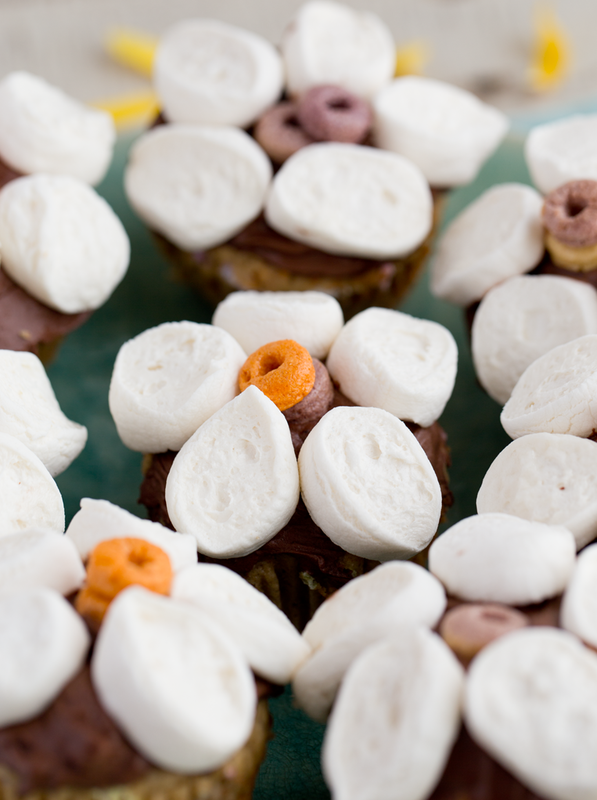 This is such a fun recipe to make with friends or kids! I made these last night. Call them my Saturday night baking project. I really loved decorating the tops of these cupcakes! Arranging the flower petals felt like a very spring-y, crafty, Pinterest-y thing to do. 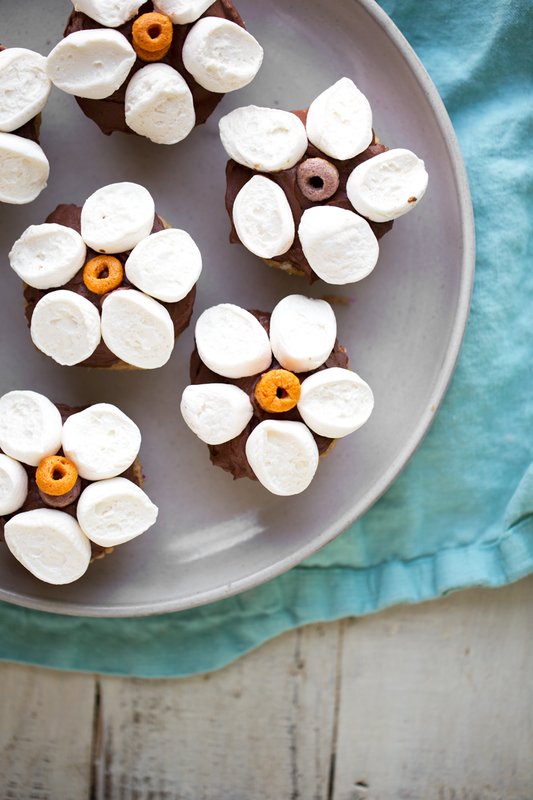 I am pretty sure kids would love decorating these cupcakes as a spring holiday project. 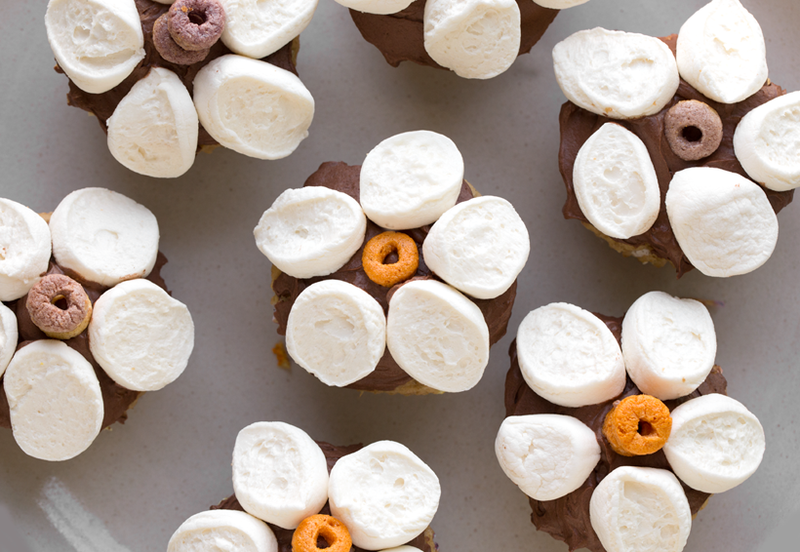 You can even get more creative with the toppings if you'd like. Vegan candy like jelly beans, pastel-colored candies, colored sugar, fresh fruit and more.. The center dot, or flower head, is a naturally colored "fruity O's" cereal piece. You could also use jelly beans, blueberries, raspberries (that would be super pretty!) or if you can find another vegan candy that would work. For the vegan marshmallows, I used Dandies brand just because they have more round-ish lines. 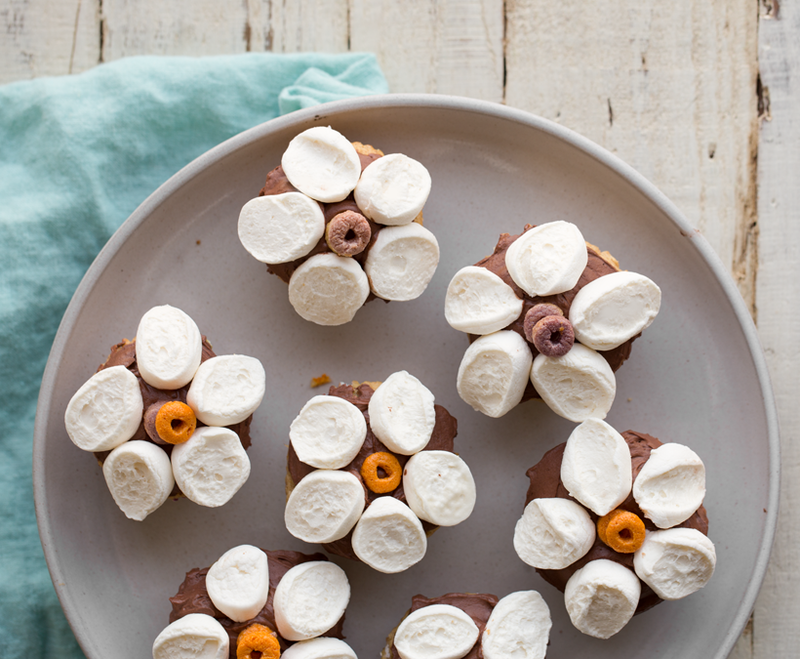 But I actually love Sweet & Sarah marshmallows too, so you can try those if you don't mind square-ish petals. For the funfetti cupcake base, I used some tofu and banana to give it body. The flavor is sweet like sprinkles with a strong accent of vanilla beans and a hint of banana. 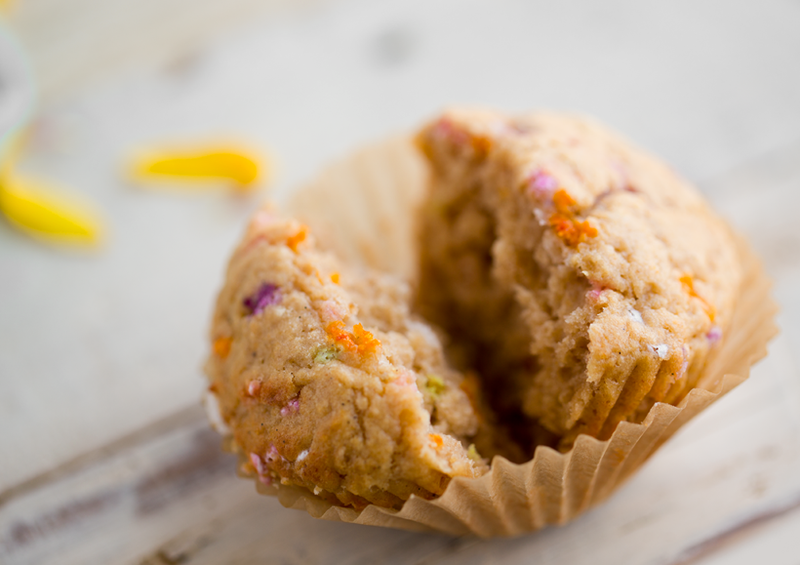 I used basic wheat flour, but you can experiment with gluten-free if preferred. 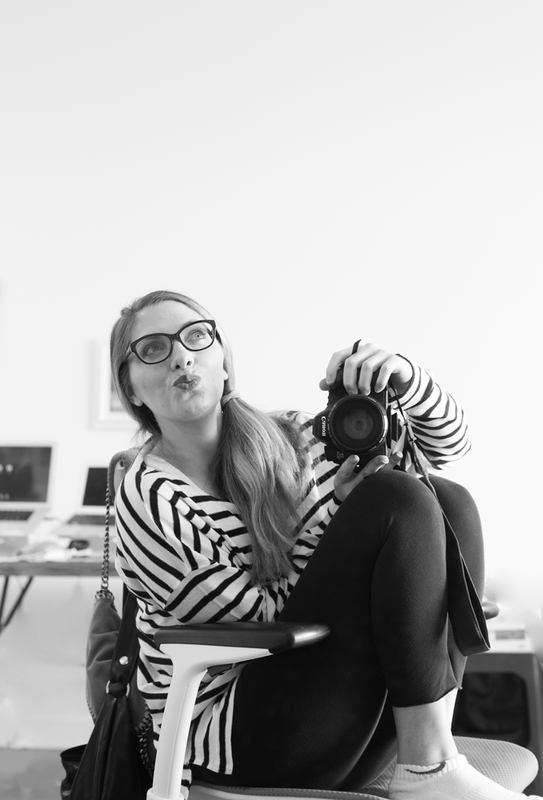 From my silly workspace to yours! Happy happy spring and enjoy these! Spring dessert! 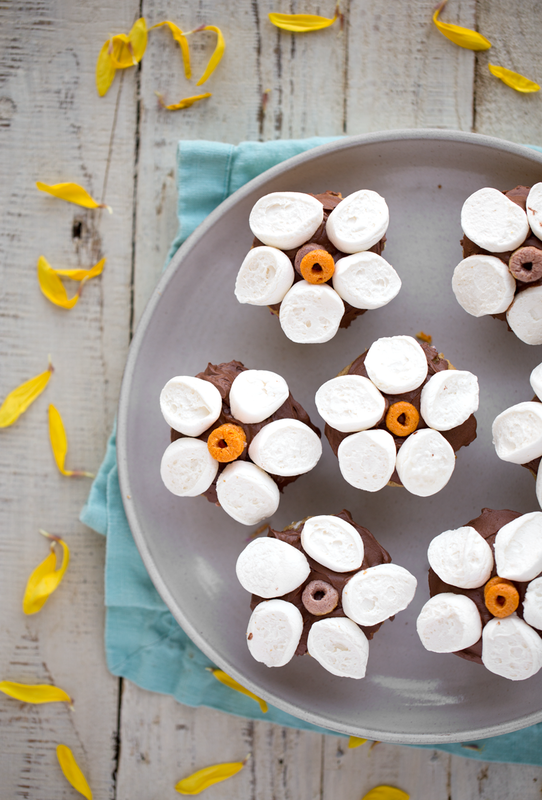 Vegan funfetti cupcakes with chocolate frosting and flower petal marshmallows on top. 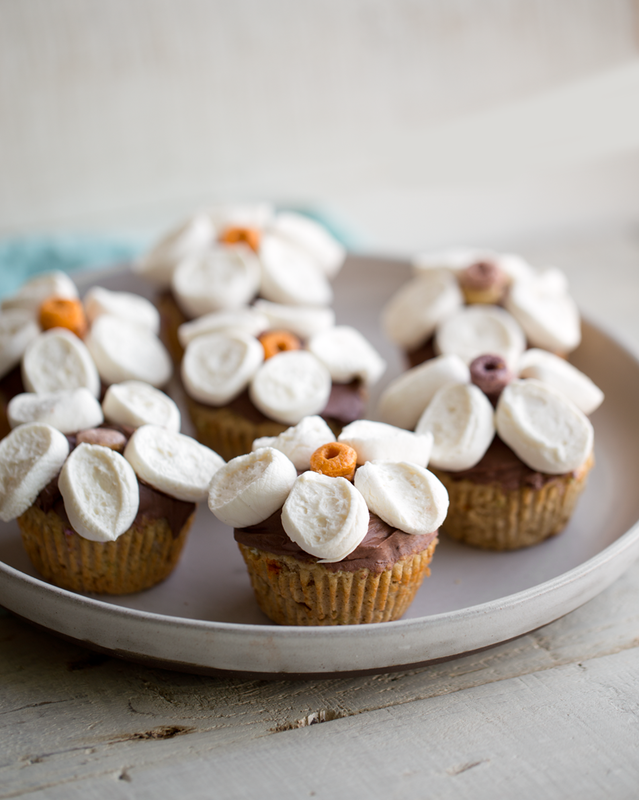 Preheat oven to 350 degrees and line a cupcake tin with cupcake liners. Add all the dry ingredients (except the sprinkles) to a large mixing bowl and combine well. Add all the wet ingredients to a blender and blend until smooth. Pour the wet mixture into the dry bowl and stir. You can us a spatula and stir by hand, or a hand or stand mixer on low - until smooth. Fold in the funfetti sprinkles. 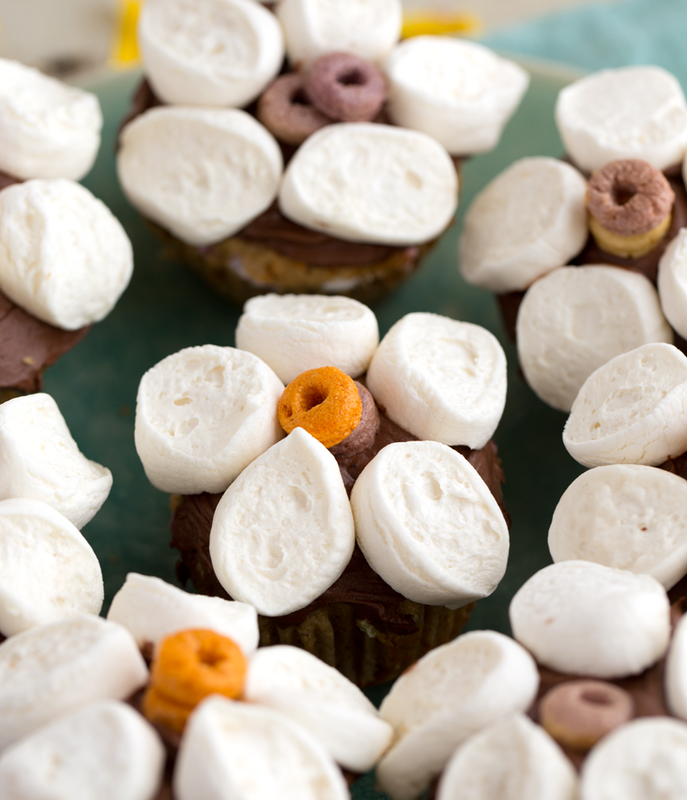 Fill cupcake tin and place in the oven. Bake at 350 degrees for 18-22 minutes. Allow the cupcakes to cool completely before topping. 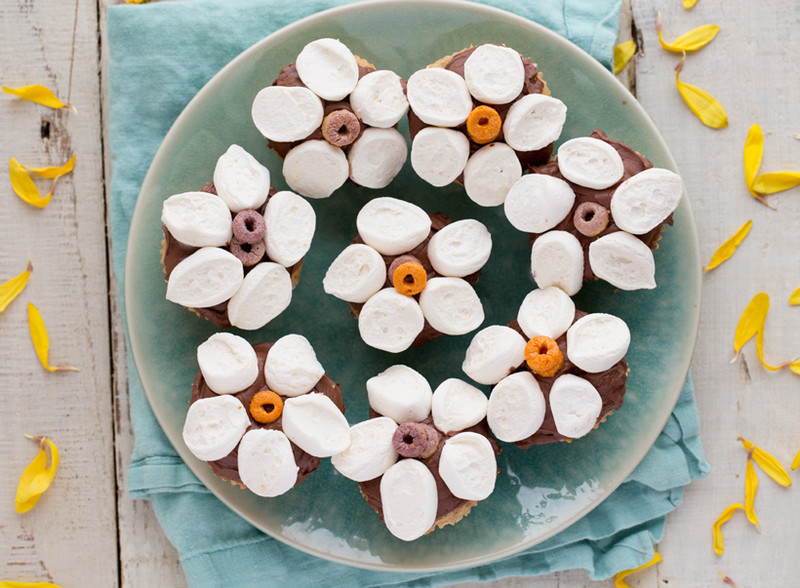 Topping: Using culinary shears, cut the marshmallows into petal slices - about 3-4 petals for every marshmallow. Prepare your chocolate frosting. (You can use other flavors or colors of frosting if you'd like, just try and stay away from vanilla so that the white petals stand out more. 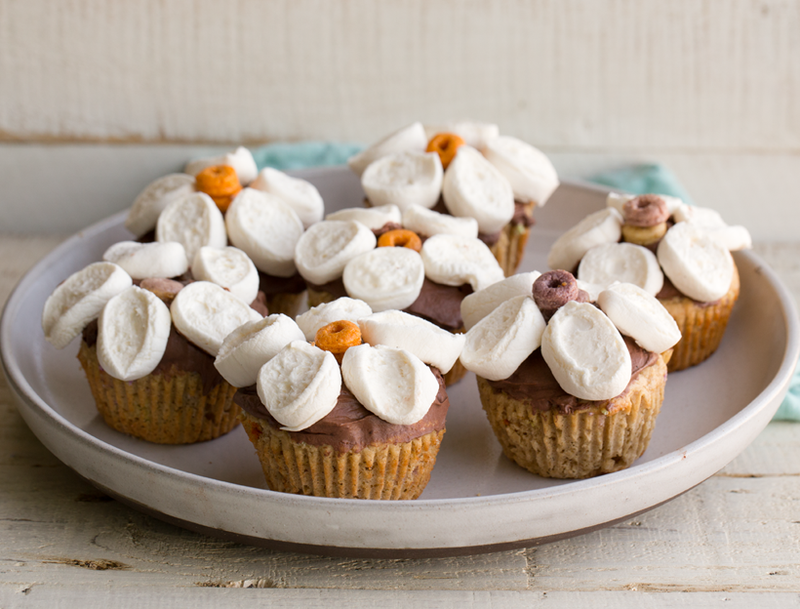 When your cupcakes are fully cooled, start decorating. Frost your first cupcake. 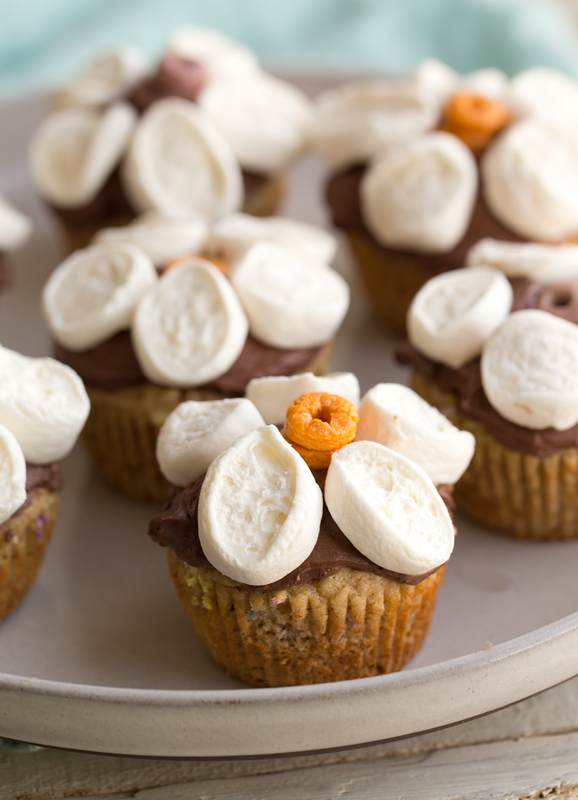 Then add one piece of cereal to the center of the cupcake, then add five petals around the edges. Repeat until all the cupcakes are done. 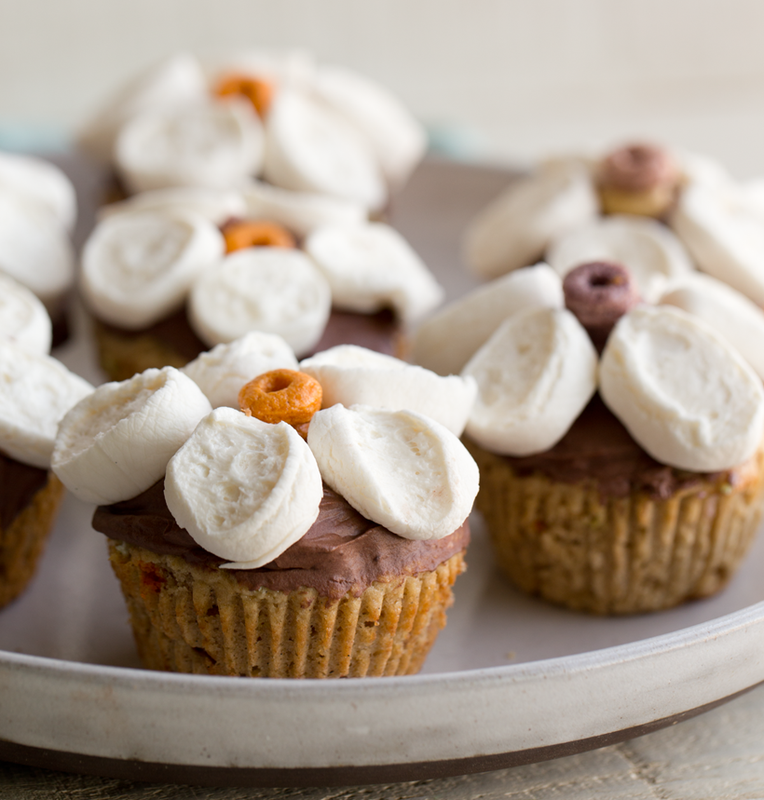 You can keep the liners on the cupcakes or remove them for a cleaner presentation. Serve right away or cover with parchment paper and chill in the fridge over night. 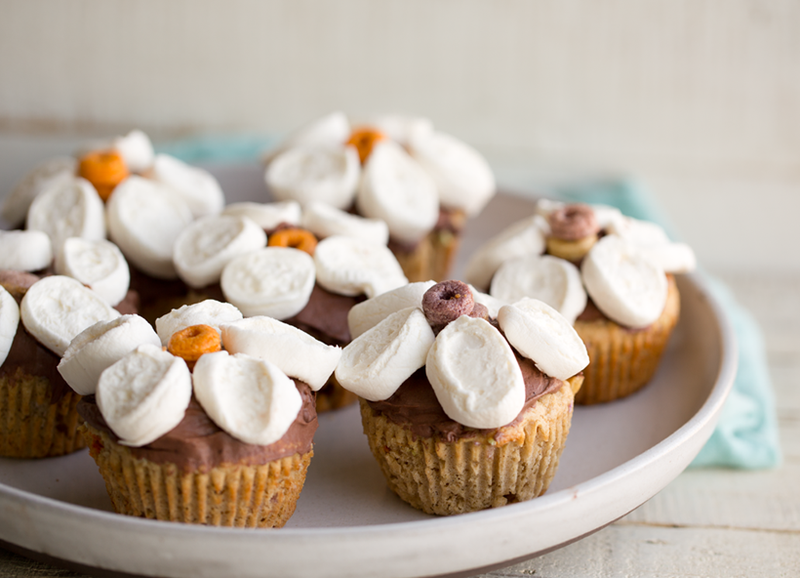 These cupcakes can be made a day ahead of time and still taste really wonderful. Just be sure to allow the cupcakes to warm to room temperature before serving.